Having kids usually means having video games and having video games usually means "Super Mario" and "Nintendo" are common household words. So it came as no suprise when my son came up to me before his 10th birthday, showed me his little mushroom shaped tin of sour candies, and told me "This is what I want my birthday cake to be!" Noooo Problem! What better use of my Betty Crocker Bake N' Fill pan than a mushroom! Once my cake was baked and cooled, placed it on a round cake board (cut down to size) and set it on top of a wedding cake stand. I coated the cake in a (generous) layer of icing and smoothed marshmallow fondant over the top, tucking it in underneath. The green was painted on with a mixture of food coloring gel and vanilla extract. 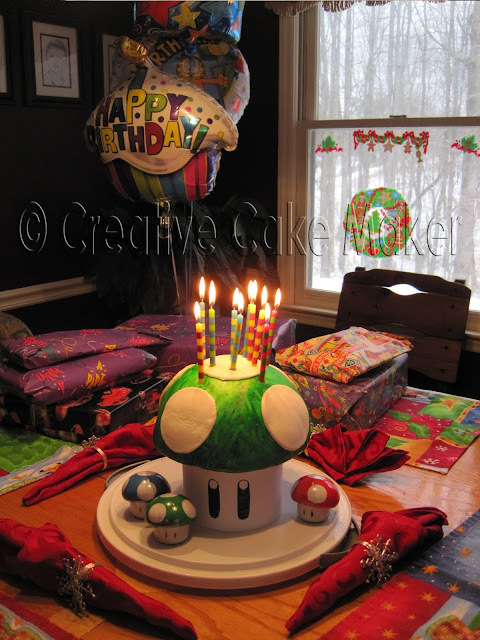 The 5 large round circles were cut out of marshmallow fondant and placed on the cake. To cover the wedding cake tower, I cut out a strip of paper, drew the eyes on it, and surrounded the base of the cake, taping it closed.